It's that time of year again - festive decorations, twinkly lights and glitter. Sequins and glitter are essential during the holiday season. I'm not a BIG sequin fan, but love some of the clothing and accessories this season and am considering to don a little glitter.. 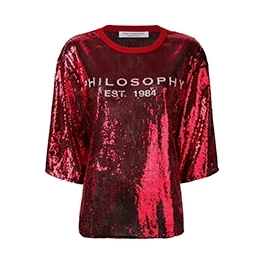 The Philosophy Di Lorenzo Serafini logo embellished blouse (available at Farfetch) is casually festive. The sequin embroidery take this relaxed fit t-shirt to a new level of Let's Party! The rich color of the red is gorgeous and shouts Christmas party. 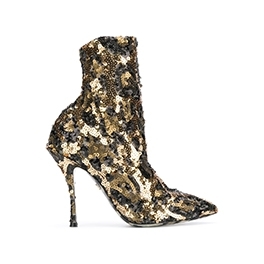 These Dolce & Gabbana sequin ankle boots (available at Farfetch) are gorgeous! The black and gold-tone sequins give these boots a sparkly-snake vibe. Pair these with a dress or fitted leather pants pants. This look is rock and roll all night long. 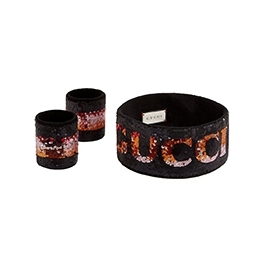 It takes a fun, fashion forward person to wear these Gucci sequin wrist cuffs and headband (available at Farfetch). I don't even know where you would wear these accessories, BUT if I saw this at the gym, I'd wanna be your friend. I suppose you could elevate your evening attire with either two wrist cuffs or the headband alone. Hmm.. Maybe the sequin headband and cuffs are about to have a serious fashion moment. 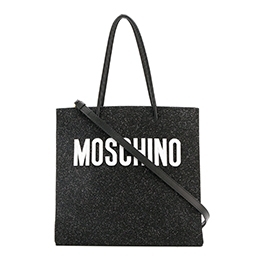 The Moschino glitter detailed logo print tote (available at Farfetch) has just enough flare for the holiday season. The white on black glitter contrast is intriguing and makes a simple statement - I'm a subtle, on-trend kinda girl. One of my favorite brands - Acne Studios. It wouldn't be a proper weekend in SOHO without stoping by the Acne Studios store AND, I always leave with a shopping bag! The signature face plaque on the laces is synonymous with the Acne Studios reinterpretation of the tennis shoe. 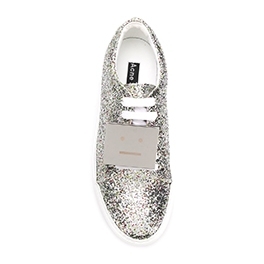 These Acne Studios Adriana sneakers (available at Farfetch) are drenched in silver-tone glitter and paired with a slip dress, would make the perfect holiday soiree look. AND, your feet will be super comfy - no heels - dance all night long! Pink and red are one of my favorite color combinations. 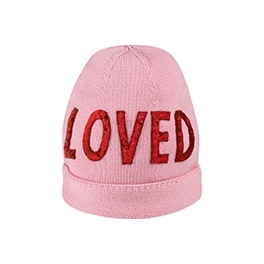 This pink Gucci wool hat (available at Farfetch) dons "Loved" in red sequins. LOVE! What's not to like about a positive message. This wool hat is fun and festive. Wear during the Christmas holidays OR Valentines (if it's still cold where you live).